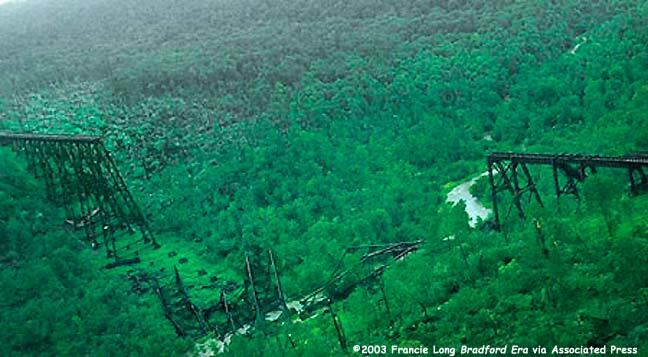 HARRISBURG, Pa., July 22 /PRNewswire/ -- A powerful storm passing through Northwestern Pennsylvania yesterday afternoon caused considerable damage to Kinzua Bridge State Park in McKean County, including the partial collapse of the historic Kinzua Viaduct. The Department of Conservation and Natural Resources and its contractor were in the midst of a multi-million dollar emergency repair project to restore the 2,053-foot-long structure. The agency last summer had closed the bridge, which annually draws thousands of pedestrian and excursion train travelers, after regular inspections showed severe rusting and deterioration within its steel understructure. "We are very fortunate that no one sustained serious injuries, but we are saddened about the extensive damage to this engineering landmark," said State Park Director Roger Fickes. An unusual wind event struck the area around 3:15 p.m. Monday, crumbling 11 of the 20 towers to the bridge, snapping hundreds of trees, and collapsing a park maintenance shed. A park worker in the shed at the time of its collapse is being treated for minor injuries. No workers were on or around the bridge at the time of collapse. Powerful winds approached the bridge from the east, opposite of normal wind patterns. Several tornadoes were sighted in the region yesterday. Six piers on the side of the bridge with the observation deck are left standing, as well as three on the other side of the bridge. The middle of the bridge, with the largest support towers, toppled from the winds. DCNR and its emergency contractor, W.M. Brode Co. of Newcomerstown, Ohio, began emergency repair work in February. Two full-time crews -- at times numbering more than 30 workers -- were assigned to the bridge work, which entailed repairs to the bottom struts of the towers, the tower legs and their lacings, and replacement of gusset brackets. The Kinzua Bridge was completed in 1882. At the time, it was the highest railroad bridge in the world at 301 feet from the valley floor. The structure was rebuilt in 1900 to handle heavier trains; it went unused from 1959 to 1987. The state park around the bridge officially opened in 1970. In 1977, the Kinzua Viaduct received national recognition when it was placed on the National Register of Historic Civil Engineering Landmarks. CONTACT: Gretchen A. Leslie, Press Secretary of the Pennsylvania Department of Conservation and Natural Resources, +1-717-772-9101.